Do you hate animals? Do you love hunting? Do you love hunting the animals you hate? If so, Cabela's Dangerous Hunts 2011 is for you! When I picked up Cabela’s Dangerous Hunts 2011 from the clearance bin, I was expecting a mediocre hunting simulation game. I probably should have known from the box art that I was in for something a bit different, but I’m not sure I could have predicted the extent to which the game defied my expectations. Dangerous Hunts lets you shoot animals. Lots and lots of animals. Upon launching Dangerous Hunts, I was presented with two options: “Gallery” and “Story”. While the promise of a story mode within a hunting game was almost too alluring to pass up, I figured gallery mode might be a better place to get a quick sense for what the game was about. Indeed, I can now tell you that Cabela’s Dangerous Hunts 2011 is not a game about hunting. Rather, Cabela’s Dangerous Hunts 2011 is a game about slaughter — specifically, the highly efficient mass slaughter of just about every type of animal you can think of. This realization is bound to dawn on you somewhere between the moment the driving rock music kicks in and the point at which you’ve killed your first dozen animals. Given that both of these things occur within the first fifteen seconds of gameplay, Dangerous Hunts tips its hand rather early. However, gallery mode is just a fraction of the Cabela’s experience. For those who really want to get inside the mind of a serial animal killer, there’s story mode. Right about the time “1982” flashes across the bottom of a black screen, you know you’re in for some serious business here. 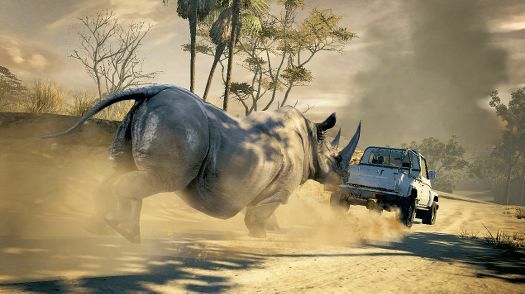 Rhinoceros car chases! Hunting! Excitement! Story mode begins with a bizarrely self-serious expedition into the cave of a legendary demonic hyena. It proceeds to tell the story of Cole Rainsford and his high-expectation hunting fanatic father, who at one point demands that Cole consume the heart of a freshly killed elk. The story is steeped in pseudo-sagelike hunter’s wisdom and punctuated by an array of bullet time sequences that involve slow-motion targeting of animals’ vital organs. 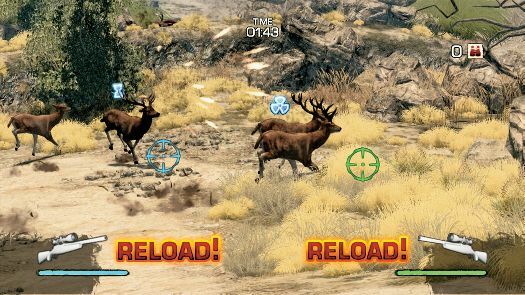 Perhaps the most surprising thing about Cabela’s Dangerous Hunts 2011 is that it ends up feeling very much like a proper video game. The graphics are of reasonable quality, the shooting mechanics feel solid enough, and the game’s rapid, flippant animal slaughter might actually look somewhat less ridiculous when compared with the rapid, flippant human slaughter in games like Call of Duty.